Please select an appropriate location on the home page of your website to add the image link. If you wish, you can add the image link to all pages of your website. Please select the image size that best fits the desired location on your website. The image sizes in pixels are included in the filenames. Right-click on the desired image above and save a copy to your local drive. Upload the image to the appropriate location in your website file system. 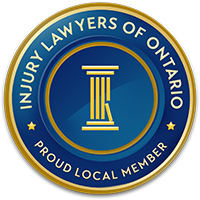 <a href="http://www.ilolaw.ca" target="_blank"><img src="<IMAGE PATH>/<FILENAME>"
Please replace <IMAGE PATH> above with the folder location where you uploaded the image. For example, if you uploaded the image to the /images folder of your website www.yourwebsite.com, you would replace <IMAGE PATH> with "http://www.yourwebsite.com/images" Then replace "<FILENAME>" with the filename of the image that you selected and uploaded, for example "ILO-Proud-Local-Member-Seal-100.png".